Barry MacLeod, managing director of Bibby Offshore in the UK, said that without a steady amount of decommissioning jobs coming in, there won’t be enough of the supply chain left to carry out work in the future. He was speaking at Decom Offshore yesterday at the AECC. Mr MacLeod said: “We need better visibility of what decommissioning work is coming up and what’s out there. “If we don’t have visibility on the timing and certainty of cessation of production dates then some of the capability is going to disappear, there is a threat of that. “If you keep deferring it and more of the supply chain suffers and fails, there’s not going to be enough of it here to do it economically in the future. Mr MacLeod was joined by a panel who warned that the conversation must also move on to incentivising work for contractors. That included Nexen’s decommissioning project manager Innes Jordan, managing director of investment bank Simmons and Co., Nick Dalgarno, and Graeme Fergusson, managing director of Decom Energy. 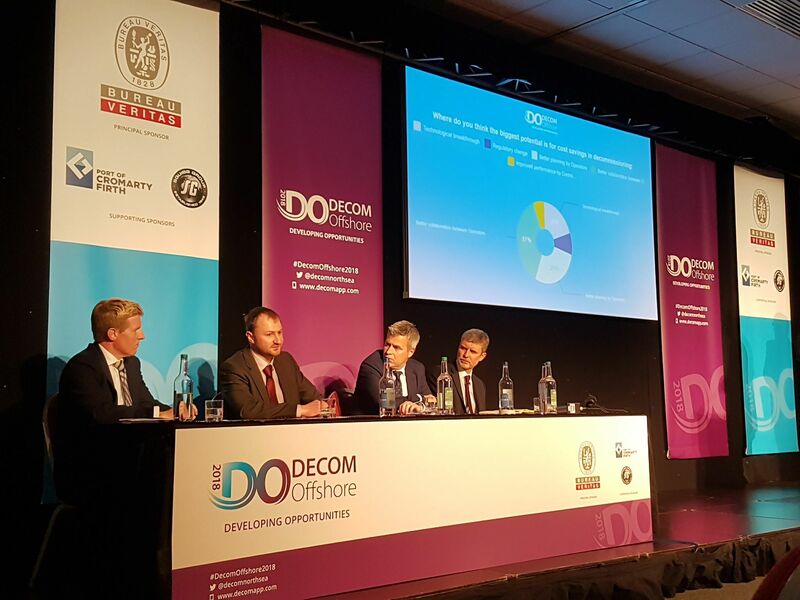 Mr Macleod’s point was agreed by Greame Fergusson from Decom Energy, who stated that if operators can clearly identify when an asset is in terminal decline, there is an opportunity to be much more efficient in the decommissioning process. Nick Dalgarno from Simmons and Co., added that the current contractor model is “encouraging inefficiency” and there needs to be incentives. He said: “Decommissioning is just one of the diversification strategies of a number of players in the supply chain and it hasn’t really come in for people yet and I think the question is when. “From our client base, the most interested groups in decommissioning is vessel owners and engineering and construction contractors. “Vessel owners make their money on day rates and E&C contractors make their money on a reimbursable cost-plus basis. “That model which has largely been a product of the oil and gas industry and some operators trying to cut costs is actually encouraging inefficiency. “It means you’ve got this natural tension between operators, for who it is all about costs, and people who are not being rewarded to save in the cost. Nexen’s Innes Jordan agreed that the model should be changed and there are opportunities for operators. He said: “The best way to save costs, and perhaps even to introduce innovations and technologies is through a better contracting model, a performance-driven contracting model. “That’s something that Nexen, not within the decommissioning space but elsewhere, have been very active in recently. “We are trying to share more and more information with the supply chain as we come up to tenders. “We are trying to work with everybody who is a party in our projects.